Jaivyn (jay-vin) is a great dog with a sad tale. 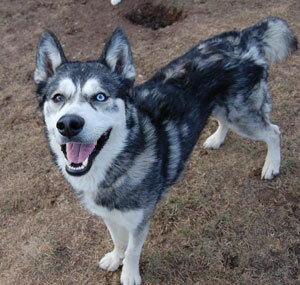 His family left him at a boarding kennel with kisses and the promise to be back soon ~ four months later and unanswered phone calls and mail found this young Siberian still waiting to go home. Jaivyn is approximately two years old and is a bi-eyed (one blue/one brown) boy with a wonderful personality and lots of spirit and pent up energy. We were met with “zoomies” around the yard as well as thankful kisses. Jaivyn is good with other dogs and thrilled to have playmates. He has recently been neutered and is grudgingly staying quiet while he heals. He is being a good sport about it, although he really, really wants to play! He is settling in with his new foster family and we are enjoying getting to know him. If you are interested in adding Jaivyn to your family and giving him a forever home, please contact us so we can tell you more about this wonderful boy.